As a House Sitting destination, Sydney could just be the most idyllic place for your next assignment. There is no place in the world quite like Sydney, one of the most beautiful cities in the world. This cosmopolitan location is surrounded by iconic beaches, world heritage areas, lush landscapes and a stunning harbour that lends itself to a seductive outdoor lifestyle. Add to this, world famous land marks, fabulous shopping, exciting events and a mixture of old and new architecture blending seamlessly together – you could easily fall in love with Sydney. 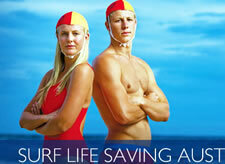 There is something for everyone here and all within a short travelling distance of the city. It has a great public transport system including the ferries which make for a relaxing, enjoyable trip at any time of the day. 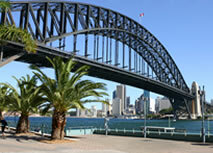 For the ultimate Sydney experience try a Harbour Bridge Climb! Taking a Bridge Climb is a truly unique way to see Sydney with its sparkling harbour and surrounds. More than two million people have climbed the 1439 steps to the very top of the bridge since it opened to the public. See all that is on offer in this magnificent city with an informative narrative by a professional guide. Twilight tours are fascinating as you commence you climb in daylight but descend the bridge in darkness with the help of headlamps. 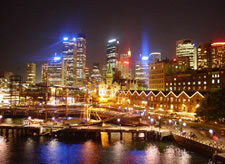 Sydney Tower is a real Sydney icon and has been an integral feature of the skyline for over 30 years. 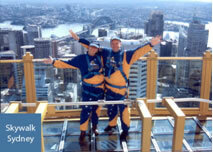 The Sky Walk is an exhilarating 45 minute walk around the top of the Sydney Tower. Feel as though you are stepping out into the clouds as you venture across the glass-bottomed viewing platform. At 260 metres above sea level it gives you a 360-degree view of Sydney at its best. This miracle of architecture and engineering has become, with the Sydney Harbour Bridge, Sydney's best-known landmark and international symbol. 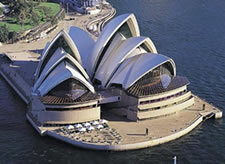 An estimated 4.5 million people visit the Opera House every year. Of these, 1.5 million attend a performance. 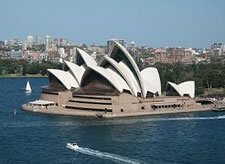 Sydney Opera House was inscribed a World Heritage Building by the United Nations Education, Scientific and Cultural Organisation's World Heritage Committee on June 28, 2007 and has joined other famous world structures such as the Taj Mahal and the Great Wall of China. 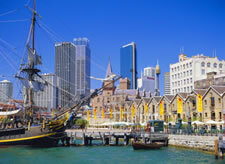 Rediscover the past and connect with Sydney's history in The Rocks area. Visit one of the many historic attractions or just soak up the atmosphere as you stroll through the streets and get a feel for the people and the place though time. Discover the Rocks of today…shopping, buskers, markets, antiques and art not to mention some of the best restaurants in town. Bondi is undoubtedly Australia's best known beach, with terraces of eye-catching Victorian houses giving it the air of a fashionable resort. One of the top reasons for going to Sydney is its reputation for excellent white-sand beaches that are only a short walk, bus or taxi ride from the city centre. You might like to visit Bronte beach for breakfast and then take the breathtaking cliff-walk round Tamarama beach and on to Bondi. Have a leisurely lunch at one of the beachside restaurants, before heading off back to town. 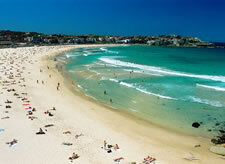 Across the Harbour you find the Northern Beaches, starting with Manly and stretching all the way north to Palm Beach. Sydney has a temperate climate and with over 340 sunny days per year, the beaches are an important part of this beautiful city. Summer average temperature 22 Celsius, Winter average temperature 13 Celsius.